And you know what’s fun to do with pesto? Spend an hour or so scooping it onto little squares of dough and then twisting it into tortellini. Seriously, way more fun than merely tossing it with warm pasta. You could just as easily do ravioli, but every time I’ve tried to make ravioli (i.e., once) the filling’s oozed out into the pasta cooking water, leaving me with a decidedly less flavorful dish than I ever would have made on purpose. So I stick to tortellini. I would have been perfectly content to toss the tortellini and some pesto into a bowl and call it a night, but this particular tortellini was crying out for a lemon cream sauce. 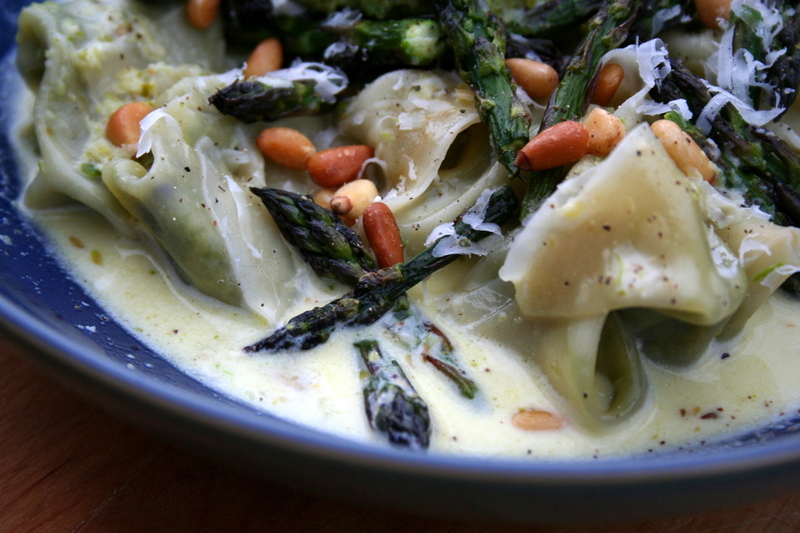 And one simply does not argue with asparagus-stuffed tortellini. 1) Trim woody ends from asparagus. Cut asparagus stalks crosswise into 2-inch pieces, reserving tips. Toss the asparagus and garlic into a baking pan, then drizzle with 2 T. olive oil and sprinkle with salt. Roast @ 450° for about 10 minutes. 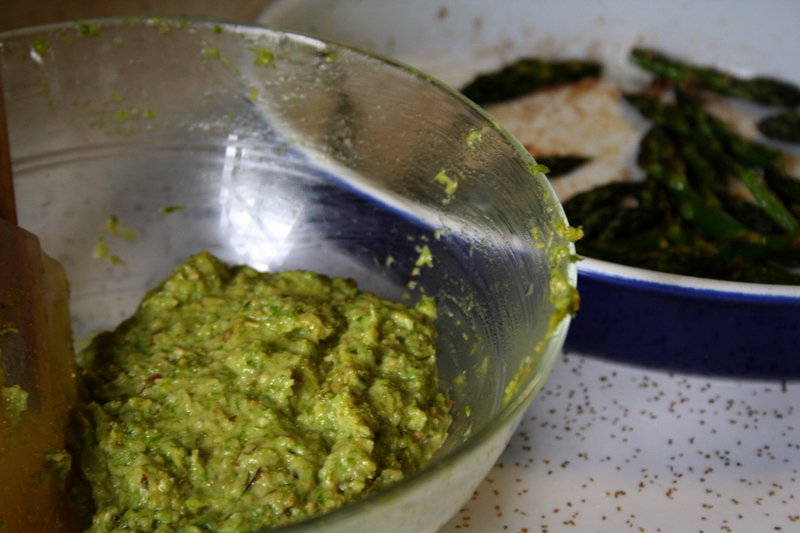 2) Dump the roasted asparagus and garlic into a food processor (or blender?) along with 1/4 c. toasted pine nuts, 1/3 c. olive oil, and the grated parmesan. Process (or blend) until combined. 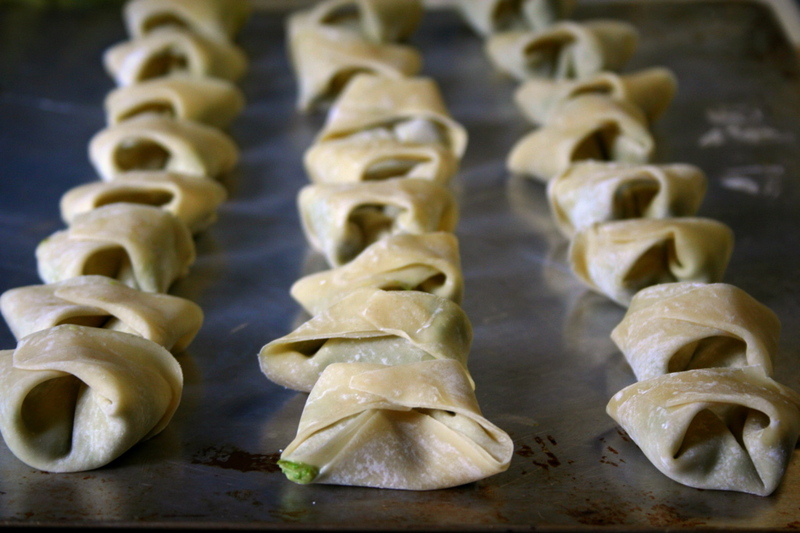 3) Spread the wonton wrappers out on a baking sheet or cutting board. 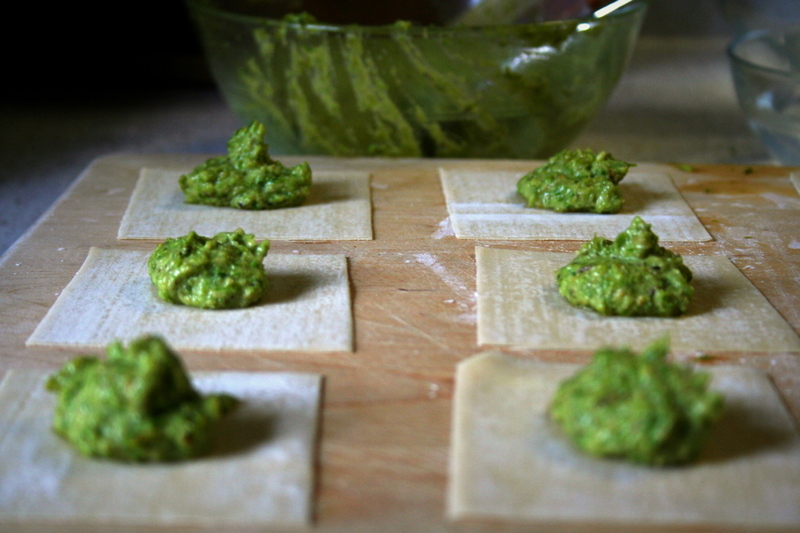 Place a small dollop of pesto in the center of each and then fold them up into tortellini. 4) Gently drop the tortellini into a pot of boiling, salted water and boil until they rise to the top, about 3 minutes. Drain. 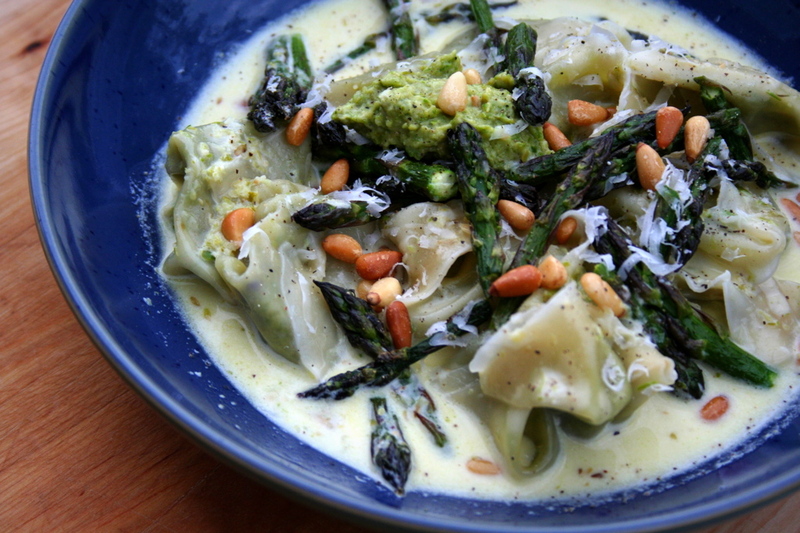 5) Toss the tortellini with the lemon cream sauce, a dollop of pesto, and the reserved asparagus tips, then sprinkle with the remaining pine nuts and parmesan cheese. Combine in small saucepan and warm over medium-low heat until the mixture bubbles gently. *One pound of asparagus makes way more pesto than you need for this dish. The recipe is easily halved if you can somehow restrain yourself in the face of fresh local asparagus, but the pesto freezes well so I’d be more inclined to double the recipe than to halve it. This entry was posted on June 12, 2008 by Megan @ When Harry Met Salad. It was filed under pasta & pizza and was tagged with asparagus, pesto, tortellini, vegetarian. My goodness! Are you on your way to Master Chefdom? Michigan has unleashed the chef! Thank God you’re blogging again! I just tried making cheese–go over to the land of lu and check it out. You’re off to a great start here. I’m hungry already. We tried to grow asparagus years ago when we first had a garden and it was a big flop. can post about stinky pee. Looks tasty. And great photography. Some other guys blog sent me. I love asparagus. Can I come for dinner? That dish looks yummy! OMG woman, I love you. Dump Chris and move to Kentucky. Thank sweet Christ that you used store-bought wrappers, or I was going to have to really really hate you. Man, that looks good. I’m always looking for new recipes so I will be back. Oh, some dude sent me. Thanks for the warm welcome, everybody! I love love LOVE asparagus – this probably isn’t the best way to showcase it, but it is a pretty good way to get vegetable-hating boyfriends (or kids) to eat it. Keep the recipes coming….I have been looking for new ideas and you have provided me with some. Thank you! I made asparagus pesto this morning right after I made my butternut squash soup. Thank you for the recipe. I neglected to separate it out when I placed it in the freezer however. I’ll have to hit it with a hammer to get a suitable one person portion. I live to learn!